Twenty days from now we’ll be in the throws of planning, prepping, cutting, cooking, roasting, steaming, and serving the most acclaimed meal of the holiday season. 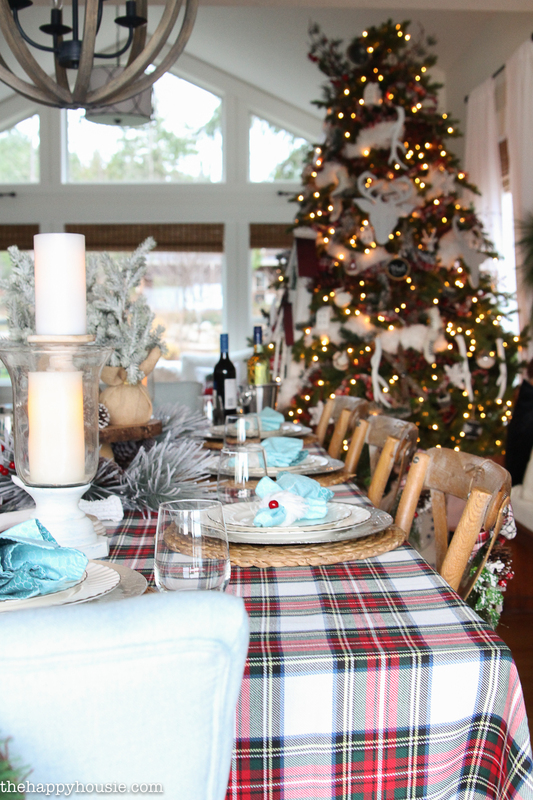 And while the food is obviously the star of the show, there’s something fun about setting a holiday tablescape worthy of the meal that’s been prepared. Classic Stewart Tartan Plaid. So crisp and fresh and pretty! When I found this extra long tablecloth at my local HomeSense, I knew it was the perfect piece to own for years to come. It will fit our table even with the two leaves added (as they are, during big family dinners), and it adds such a beautiful and festive feel that the rest of the details can remain soft and simple. 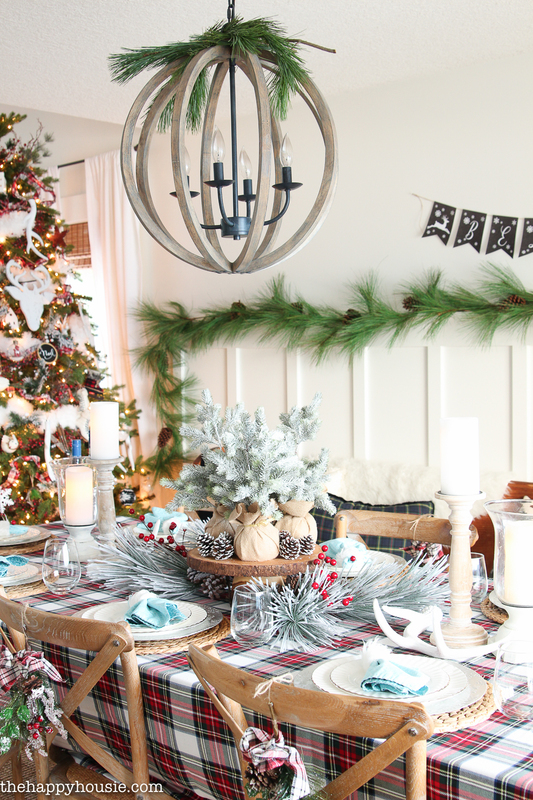 I added some pretty floral picks tied with plaid ribbon to the back of the chairs, grouped together some mini flocked Christmas trees on a wood slice stand, and added some candles and our white ceramic antlers. 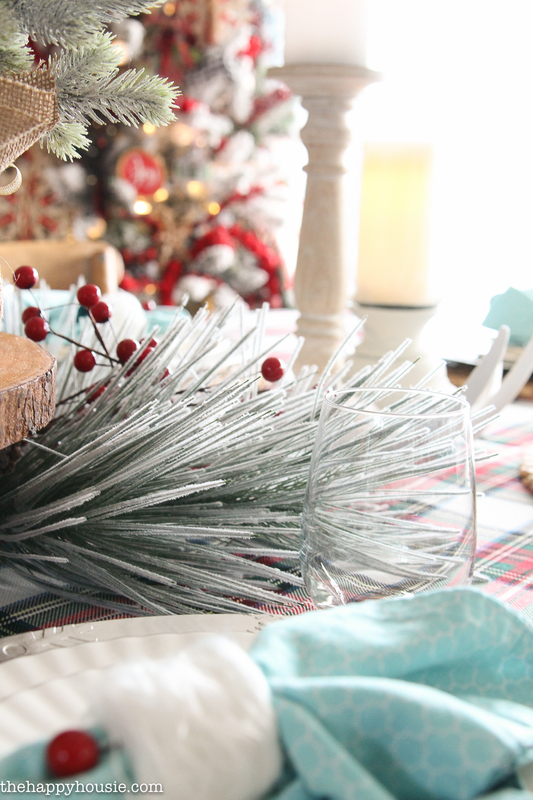 The only new pieces are the tablecloth and the flocked pine branches. Everything else is repurposed from previous years! 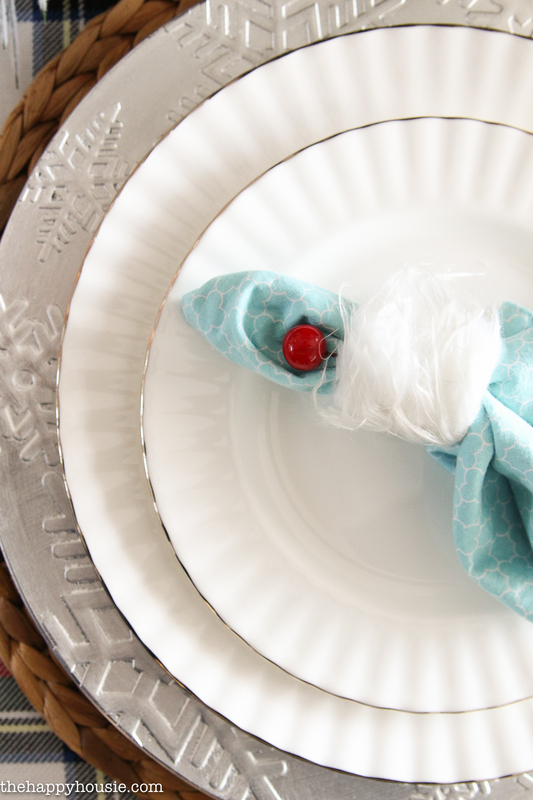 I made the napkin rings myself and will share the DIY soon; the double sided napkins were also a simple sewing project that I shared the DIY for here. 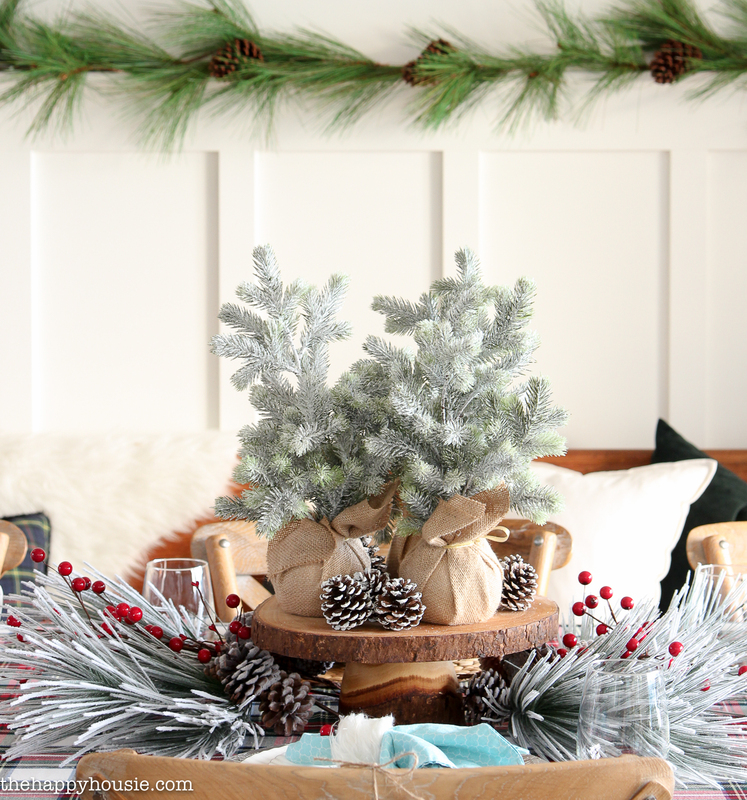 The pine garlands all around our house were a Costco find last year; and the faux chalkboard BELIEVE banner is a free printable that I shared here! My Mom lent me the china as we don’t have any dress-up dishes of our own yet…and really, they are always invited to dinner, so they might as well bring the nice plates along, amIright?! I absolutely love these new, lower profile, super comfortable dining chairs in a beautiful light sky blue colour. 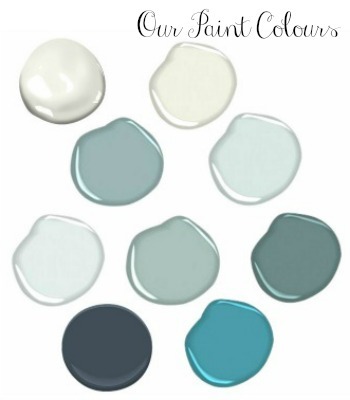 They connect perfectly with the colour of our kitchen peninsula, range hood, and rug. 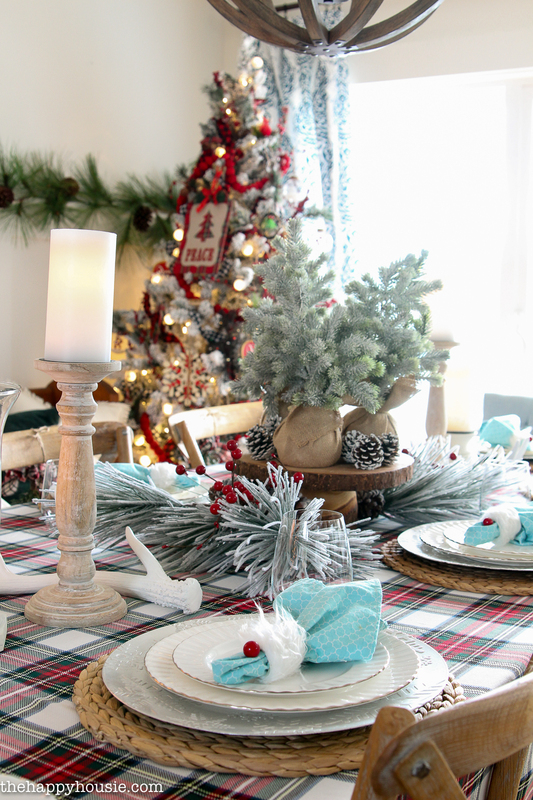 The mini flocked trees and flocked pine branches are both from Michaels; the picks that I turned into swags on the backs of the chairs are from Walmart as are our silver charger plates. What do you think? Want to come over for Christmas this year? Let’s see how long we can keep things this pretty before it’s covered in red wine or gravy; or both! Did you see something that you love? 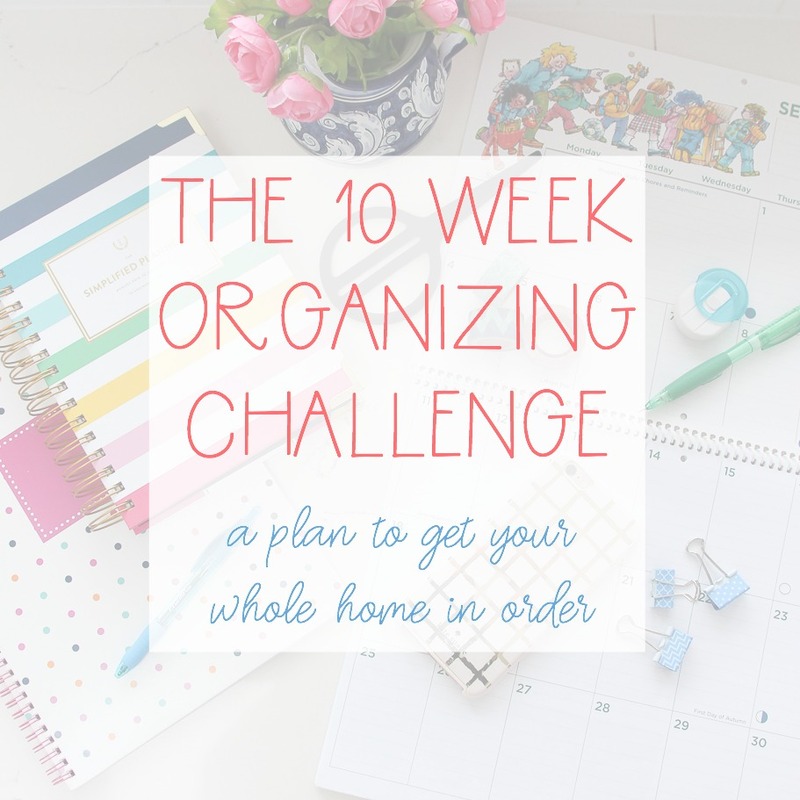 I’ve tried to gather together my sources or similar sources for you! 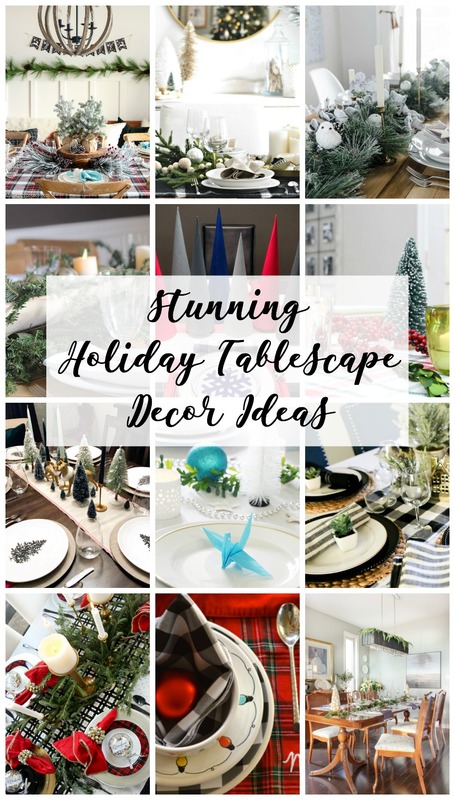 And don’t forget that today I’ve joined forces with some other talented bloggers to share our ideas for making your holiday table festive and welcoming! 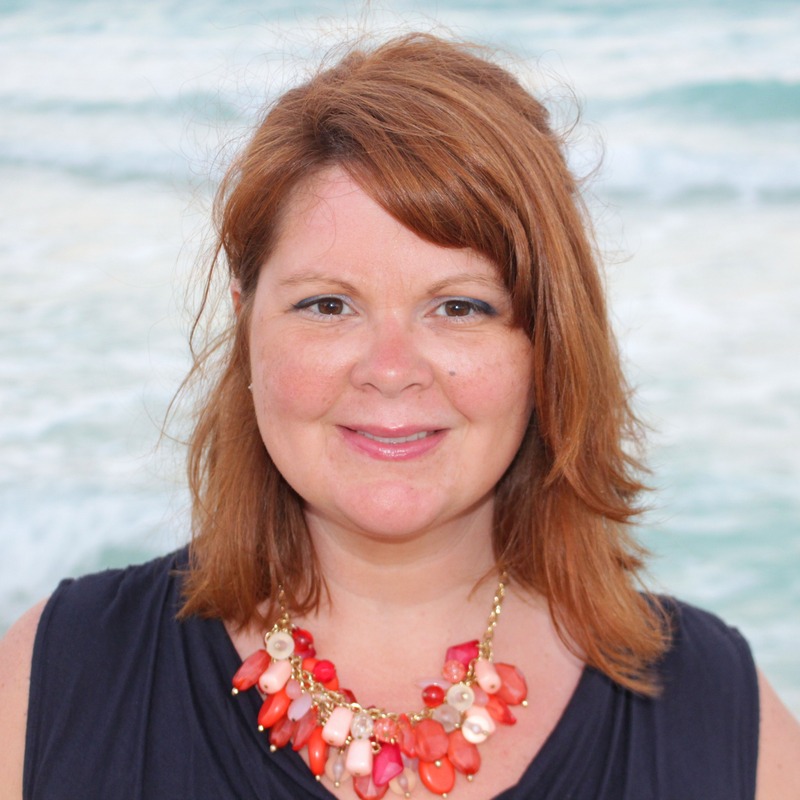 Enjoy the tours – I know I was inspired! This is so beautiful! And I love how you added a few splashes of your signature color with the napkins! Your table feels so fresh and inviting. 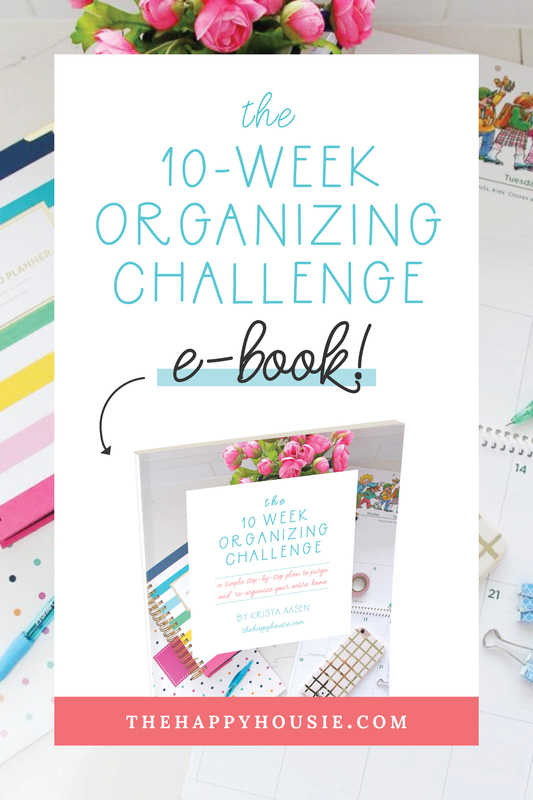 Thank you for linking up with Merry Monday – I’ll be featuring your table decor at our upcoming party! Merry Christmas! Your dining room looks beautiful! I love the plaid you chose to use. 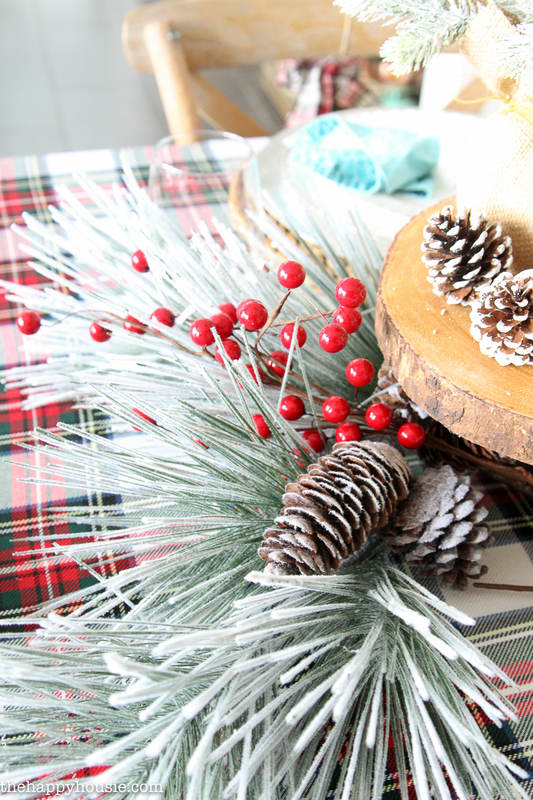 Lovely plaid tablescape. I particularly like the evergreen bundles on the backs of the chairs. Thanks for sharing on Share Your Style! 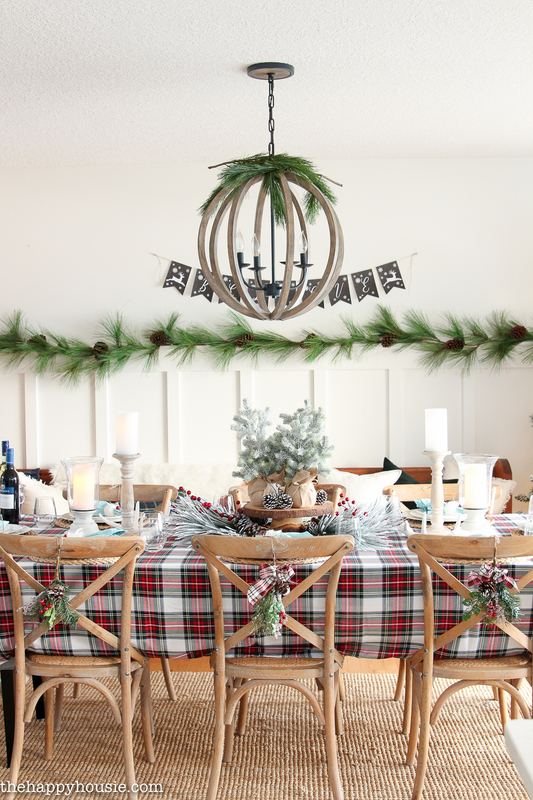 Love the flocked greenery – the perfect touch with the plaid! 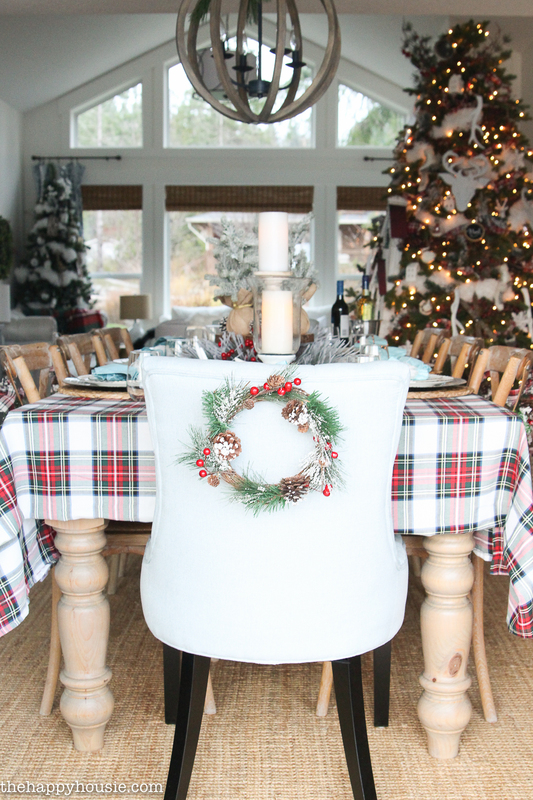 I absolutely love your new tartan tablecloth and all the red and green touches! Just beautiful Krista! Thanks so much for all your hard work for our tablescape hop! 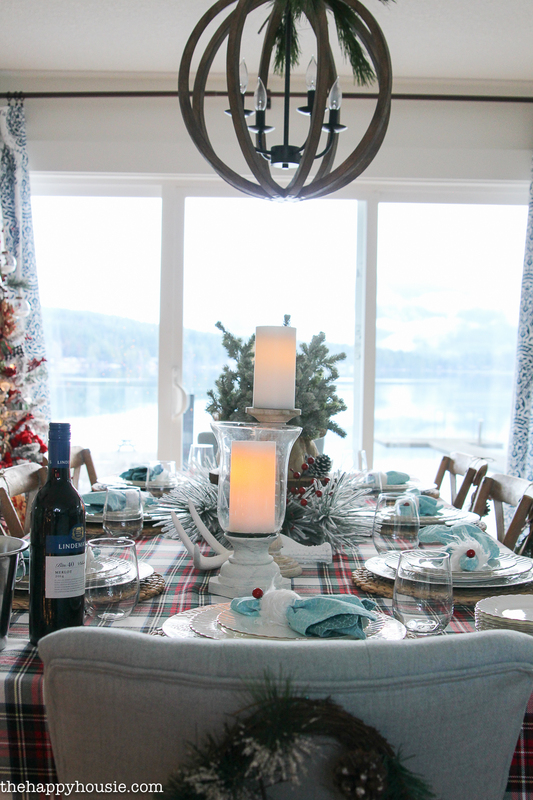 I just love all of your festive touches – that tablecloth is perfect! 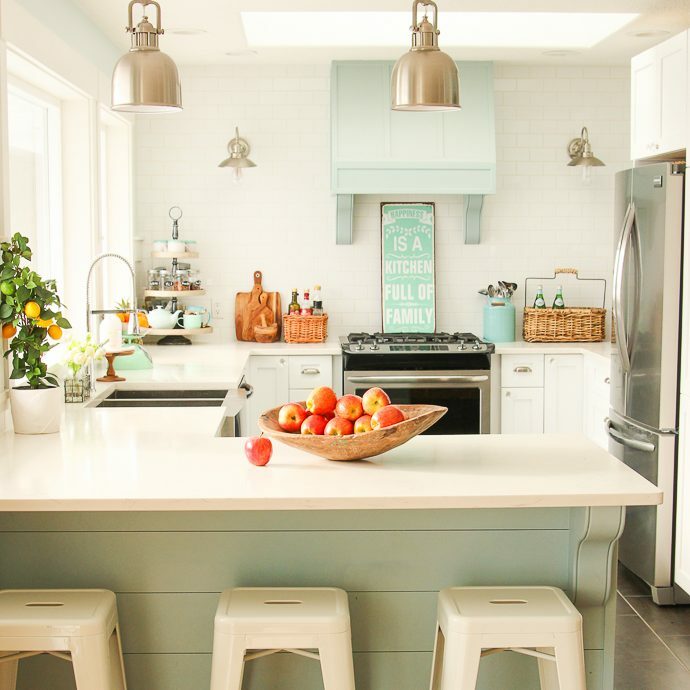 Love your light fixture, too! Thanks for organizing the hop! This is every so lovely! The tartan is the perfect colour!!! Beautiful! Beautiful! 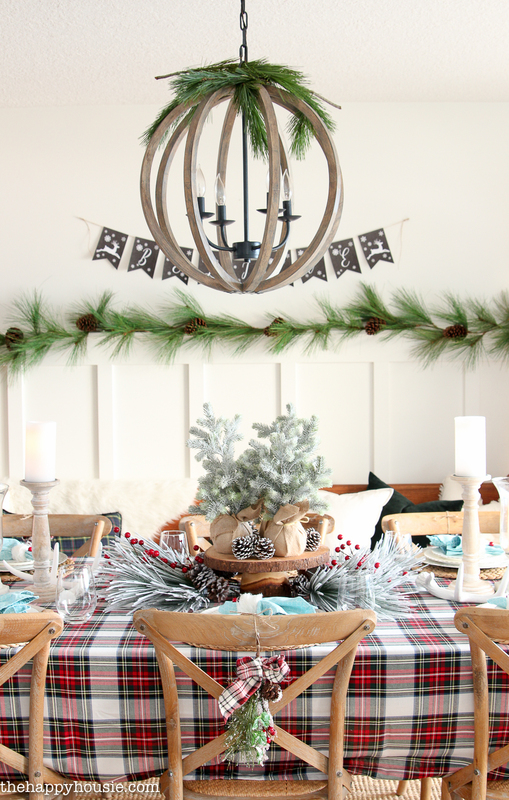 The plaid tablecloth is just the perfect touch – and all the greenery is stunning. Hi Krista! 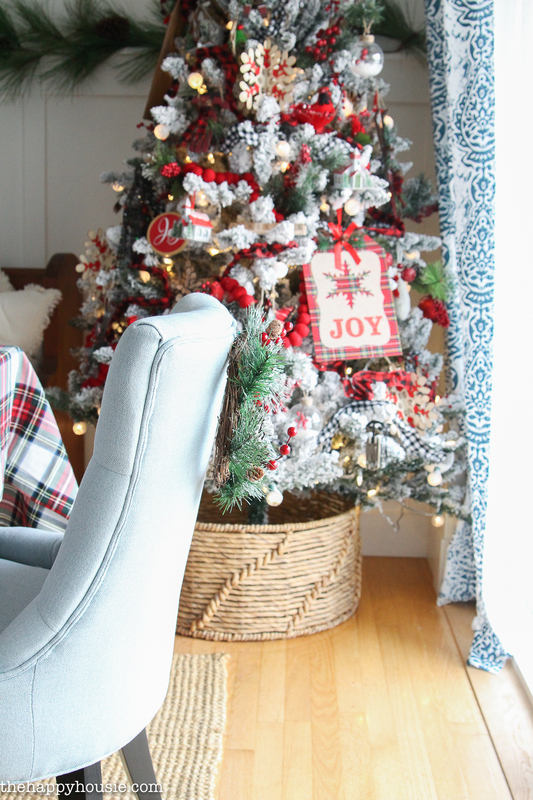 New to your blog and I was so happy to see your plaid table cloth, so cute! Also great post with lots of great details. 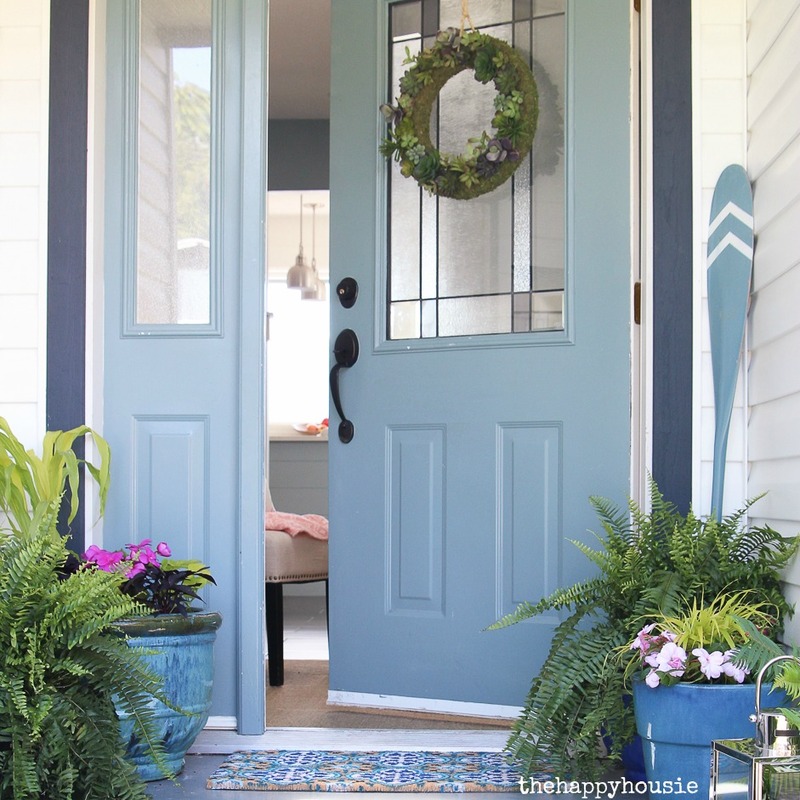 Awesome job with the decor, I look forward to catching up on old posts and reading you new ones as well!